Days of Our Lives Spoilers: Abigail Learns Some Surprising News! 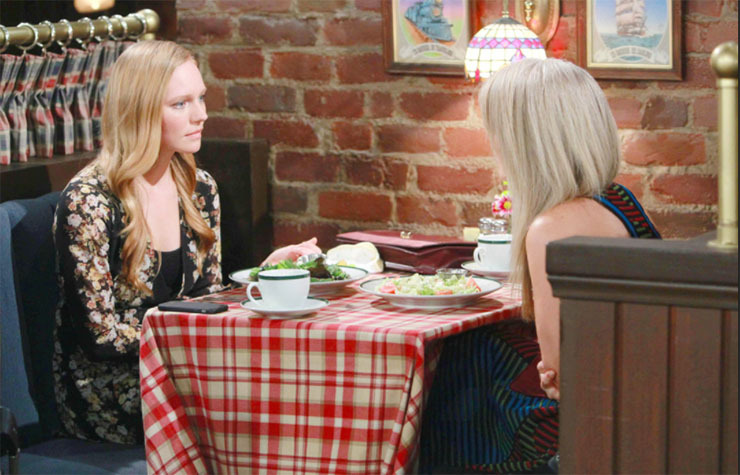 Days of Our Lives Spoilers, Wednesday, April 26th: Abigail Learns Some Surprising News! Abigail and Jennifer in the Days of Our Lives spoilers. The Days of Our Lives spoilers for Wednesday, April 26th, predict that Abigail gets to know her mother a little better–and becomes privy to some interesting info about her past! Yes, it’s true. Even (at times) innocent Jennifer (Melissa Reeves) has loved, lost, and left it all behind her. And this is a soap, after all, so people’s pasts are usually extremely colorful, to say the least. Wednesday, Abigail (Marci Miller) is surprised to learn that Jennifer and Eric (Greg Vaughan) have a history. Meanwhile, Abigail gets that job she wants at the police station. Also, Joey is as stunned as we were to learn that Jade is moving in with Lucas. We at Soap Cities just love zany, hilarious Anne (Meredith Scott Lynn). Apparently, so does Lucas (Bryan Datillo)! He and she of the super-gorgeous hair kiss. They also discuss Jennifer, who happens to catch their intimate moment and gets in Anne’s face about it. We love it when these two spar, don’t you, dear Soap Cities readers? Lani (Sal Stowers) and JJ (Casey Moss) are jumping right into this dangerous new case they’ve been assigned. Lani has an ugly encounter with a pimp who goes by the intimidating name, “Snake.” Will JJ swoop in to comfort her? Next Article The Bold and the Beautiful Spoilers, Wednesday, April 26th: Things Are Loco for Coco!